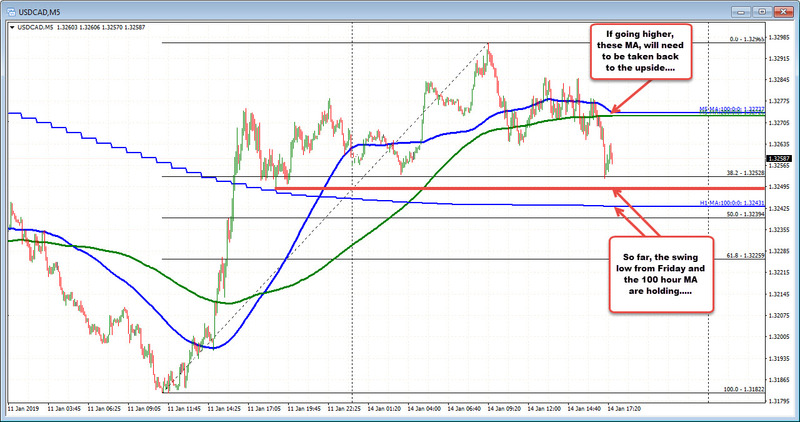 The USDCAD moved above the 100 hour MA (blue line on chart below) on Friday and stayed above. Today that range was extended, helped by lower oil (price fell to $50.43) and some risk off flows, but the gains in the pair were limited (high reached 1.32908). The price has just moved back toward the earlier Asian low at 1.3253. The low just reached 1.3252. Crude oil is back to unchanged at $51.59. Stocks are off low levels as well. The range for the day is still very narrow at 44 pips (the 22 day average is 82 pips). So there is room to roam. On the downside, however, the 100 hour MA at 1.32431 should give sellers a cause for pause. The rise above was the first since January 3rd. Of course oil and stocks may have a say in that level with a calendar that does not have anything on it. A move off higher, targets the 1.33215 high from January 8th. Above that the 200 hour MA at 1.3347 (and moving lower) would be upside targets.